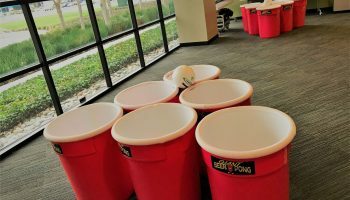 Let us “wow” your guests with our Giant Beer Pong game rental. It is so big, it won’t even fit on a table! Instead, our giant beer pong sets up outside or another large open space. Perfect for any wedding, corporate event, bachelor party or anywhere with a large open space! Instead of the classic red solo cups of standard beer pong, our Giant Beer Pong game uses giant red solo cup replica trash cans. These are designed to look just like red solo cups and give you the classic feel of the beer pong game. Twelve of these cans are arranged like the regular game. Instead of filling them with beer, they can be filled with water, beer or any other of your favorite beverages. The regular ping pong ball has also been replaced with a white volleyball. As before, this is picked specifically to maintain the appearance of the classic beer pong game. Teams or players will take turns throwing or bouncing the ping pong ball across the playing area to try and make it into the opposing team’s can. If they manage to get one, that cup is pulled to the side and play continues. The first team to eliminate all the cans from the opposing team’s side wins! 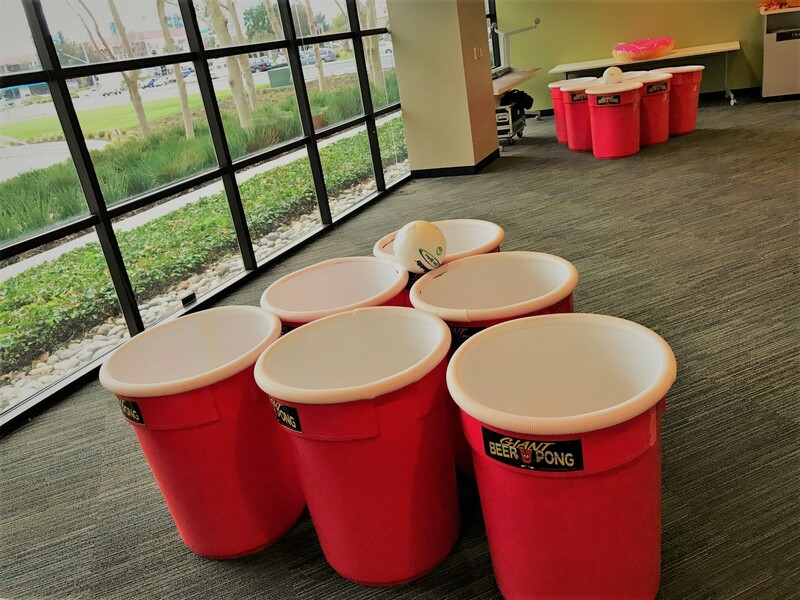 We deliver our Giant Beer Pong game rental to anywhere in Santa Cruz, the greater San Jose area, the San Francisco Bay Area, Monterey Bay, Paso Robles, San Luis Obispo and Northern California.